And so we did, and better still, they agreed. 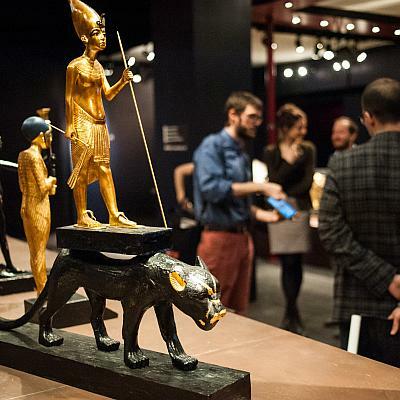 Drop in on Sunday April 10th, between 11am to 2pm, when the price of your exhibition admission ticket will include a free King Tut Museum Hack tour ; but remember, it’s first come first served. Museum Hack leads renegade tours of the world’s best museums. 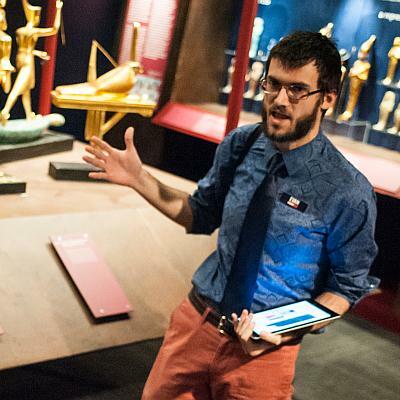 These tours include the untold stories of the art and artists, juicy gossip about the museum and activities in the galleries like “Buy, Burn, Steal” and “Yearbook Tags.” Every tour is unique and customized on the fly to include the pieces the Museum Hack guides and their guests care most about. The overall theme is to make tours fun and engaging, and to help overcome museum fatigue – a real problem, where visitors get tired and bored when they visit museums. Museum Hack offers public tours at four major museums in the US, including the Metropolitan Museum of Art in NYC, the American Museum of Natural History in NYC, the National Gallery of Art in DC, and the de Young Fine Arts Museums of San Francisco in SF.